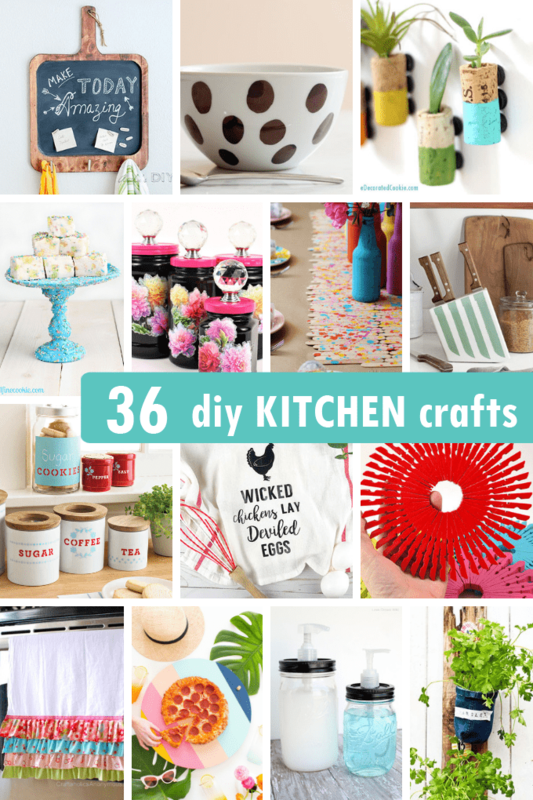 36 AWESOME DIY KITCHEN CRAFTS -- Projects for your kitchen. 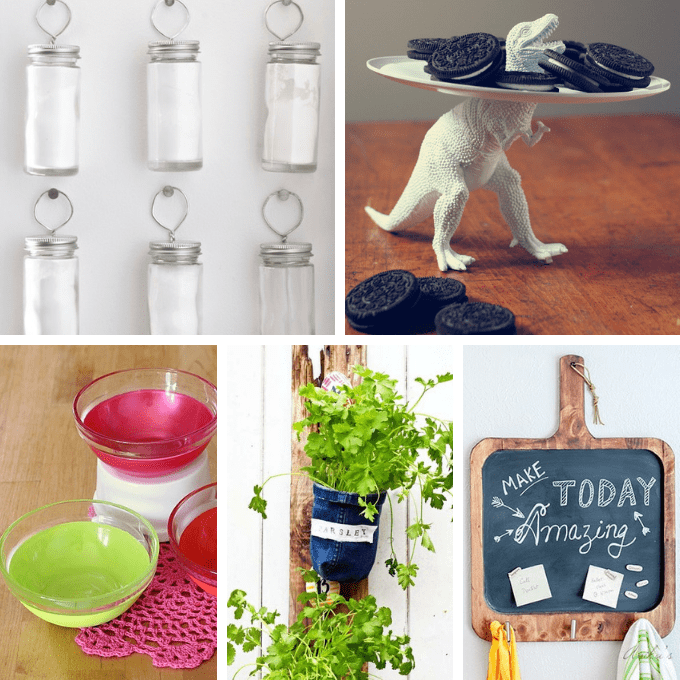 A roundup of 36 awesome and clever DIY kitchen crafts. 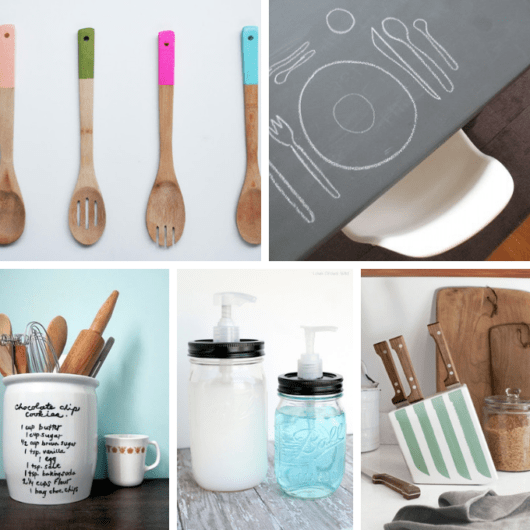 “DIY kitchen crafts,” as in kitchenware, tableware, some partyware… All the wares. 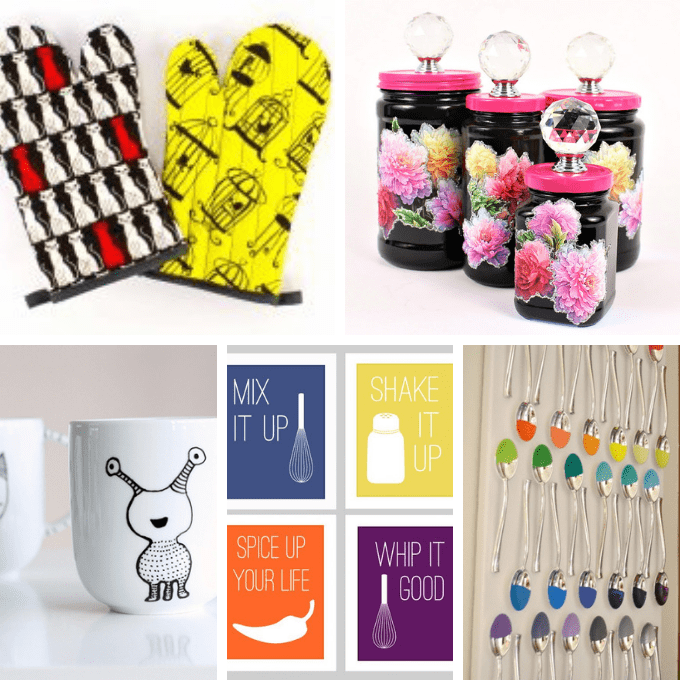 Utensils, placemats, dishes, stuff to decorate tables for parties. That’s what this roundup is, but all DIY. You know, because you folks are so clever and crafty and have lots of free time. (Maybe not that last part.) If you had all day with nothing to do, no appointments, no cleaning, no chores, no errands, no work, nothing, zippo, zilch, would you spend the day making things? Creating? I might. I might also watch a lot of TV, admittedly. And maybe I would go outside for just a little bit, depending on the weather. Turn wine corks into succulent planter magnets. I want these storage containers, by Martha Stewart. How to make a retro lazy susan, from Sugar and Cloth. I heart sprinkles. Make a sprinkle stand at 1 Fine Cookie. Make magnets from jewelry at Country Living. Blah to wow painted kitchen utensils at The Plumed Nest. Make a whole chalkboard table at Design Sponge. That recipe will always be on the counter: Recipe utensil holder at Calico. Make mason jar soap dispensers at Love Grows Wild. Clever. Paint your own knife block at Country Living. Smart! Make a hanging spice organizer at Freckled Laundry. Everybody needs a dinosaur serving dish. How-tos at Three Little Monkeys Studio. I’m a fan of simple. Painted bowls at Madigan Made. Make a denim indoor herb garden at Pillar Box Blue. 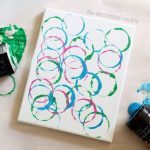 Love this DIY magnetic chalkboard at Anika’s DIY Life. Make your own oven mitts at Professor Pincushion. Painted ginger jars from Mark Montano are gorgeous. Porcelain pens make some funky mugs, at Tuts+. 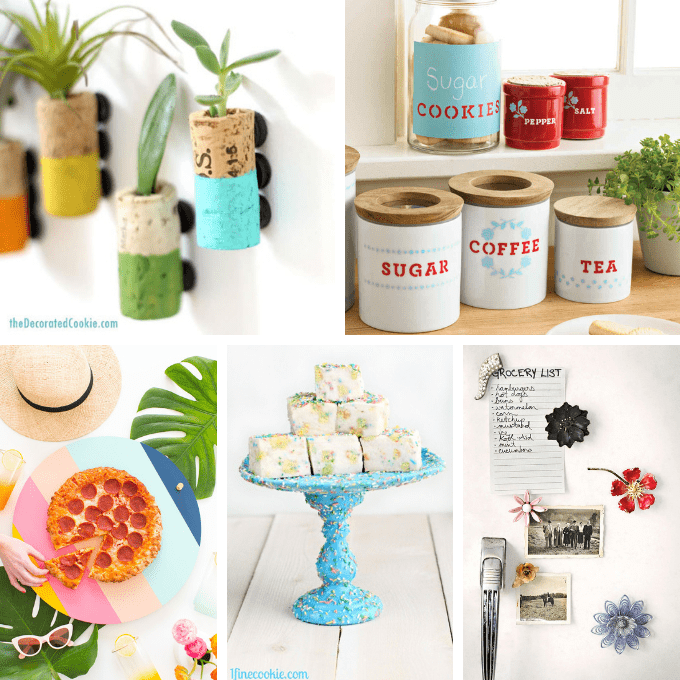 Find free printables for kitchen art at Over the Big Moon. 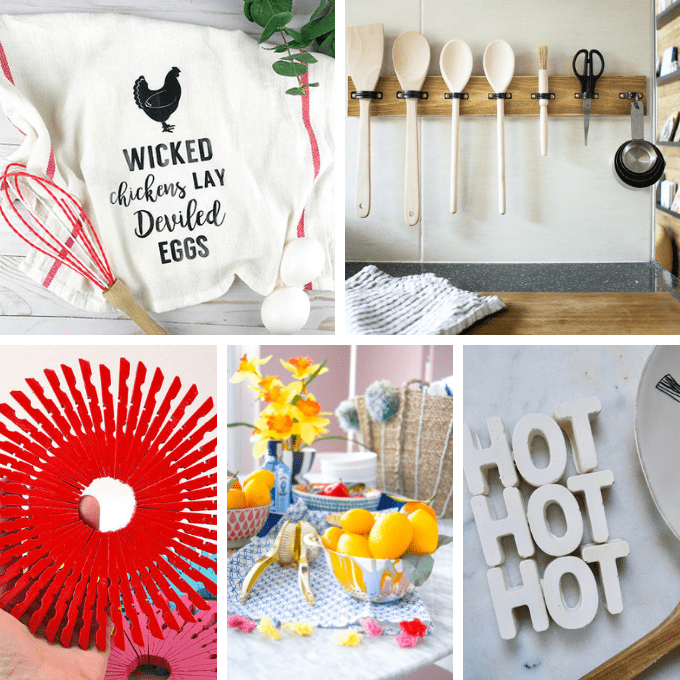 Make fantastic kitchen art from plastic spoons at Papery and Cakery. Ha! To this wicked chicken dish towel with free printable from Clumsy Crafter. Make your own utensil rack at Grillo Designs. Colorful clothespin trivets from Dream a Litter Bigger. Find the how-tos for paint marbled colanders at PMQ for TWO. 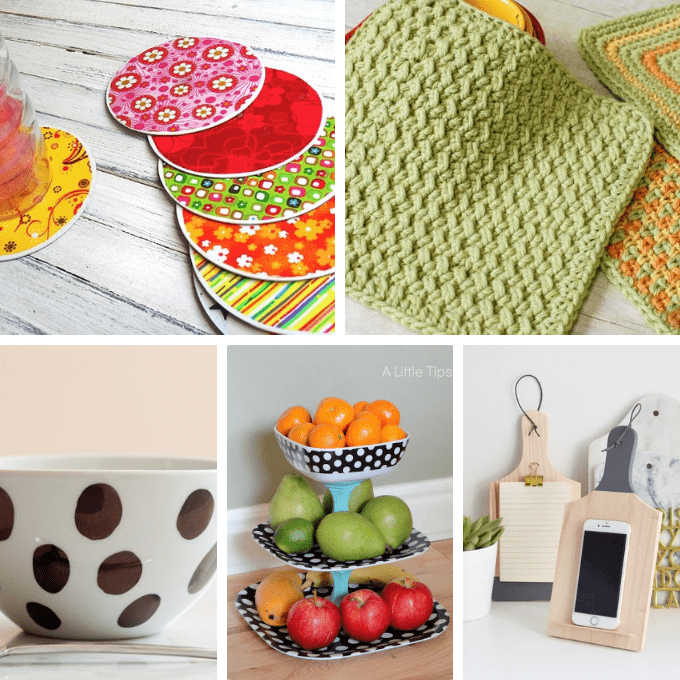 Craft a Hot Hot Hot trivet at We’re Going to Make It. Old CDs turned into coasters? Freakin’ awesome. How-tos at Crafts by Amanda. Crochet a dishcloth at Petals to Picots. I want to redo my whole kitchen in polka dots to match these diy fruit stands, at A Little Tipsy. Check out this DIY chopping board tablet holder at The Things She Makes. We all need some ruffled kitchen towels, at Craftaholics Anonymous. 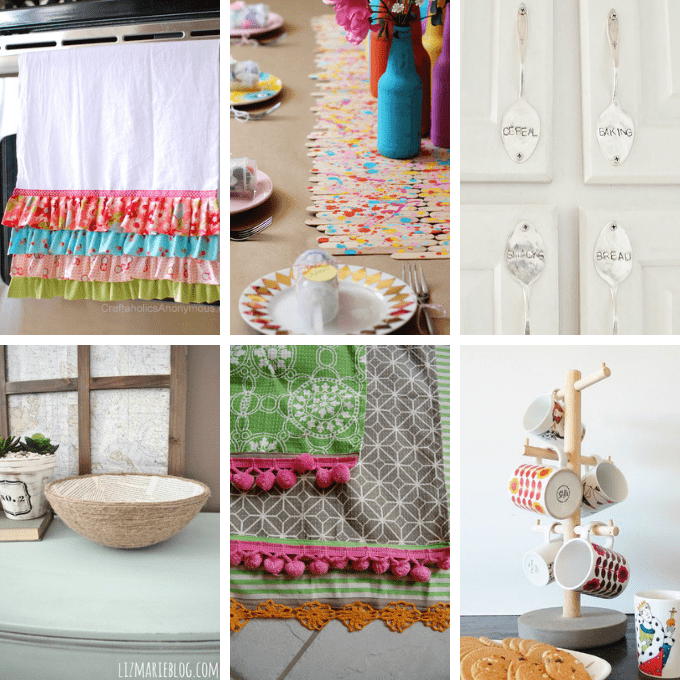 A splatter paint popsicle stick table runner is perfect for a kids’ table, by At Home in Love. Update your cabinets with stamped spoon handles at Thistlewood Farms. Oooh, a gift for a writer! Make a book page rope bowl at Liz Marie. Anthro-inspired dish towels from The Fab Miss B. Bob Vila teaches you to make your own mug tree. I have some old cabinet doors and I want to turn them into trays or just something useful. 26 is a perfect idea! Thanks for putting this together I’m always looking for creative ways to repurpose things around the house. We are just cleaning out the garage and I have about 10 projects that I want to do so this is really great! ohh these are such a cute ideas! love them all, now I just have to find the time and get going with my crafty talent. you are amazing I just love all your ideas. I am always looking so I can get started early for gift giving on the Holidays. Keep giving us ideas and I’ll keep looking every day. You have a great post. thanks for sharing this lovely post.